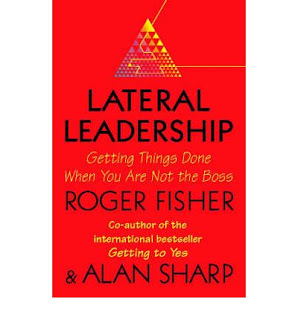 Lateral Leadership - Getting it done when you are not the boss is a leadership book written by Roger Fisher and Alan Sharp. To be honest, it was not a pleasant read because of the writing style of authors. This is in spite of the fact that it's a short book and Viva Books printed it in good quality paper even if it was a low priced edition :) I expected the book to be something catering to professionals in roles without having the authority ( like a Product Manager or Business Analyst). But the book tries to be lot of things. The authors take a two fold approach - first on improving the personal skills and later on to use them to improve collaboration and lead teams. At certain points, I felt it's more a personal skills training book than one on team building or leadership; may be it is due to the fact that it's all interlinked. The book is written in the three parts. First one introduces the topic of lateral leadership and what the authors mean by the term. The second part dives deep into the components of lateral leadership - how to first develop the personal skills required and then to pass on them to your team. Last part is a conclusive discussion on how to keep improving yourself with these learning. The crux of the book is that we should understand the the real purpose of why we are doing something , make the team understand and own it; once this is achieved, cultivate a culture in yourselves and within the team to come up with thoughts, actions and ownership in achieving the goals. The authors also cautions about 'paralysis with analysis' often seen in discussions and also how to keep the team members engaged. Finally, there is a decent discussion on how to give and receive feedback as well. 2. Cut short on unnecessary theory since it's meant more for a professional audience than academia. Overall, just a decent book to read. Five TED Talks for all MBAs and MBA aspirants!